Since dogs cannot tell us what’s wrong or what they’re feeling, your dog is completely dependent on you for his overall health and wellbeing. No one knows your dog as well as you do. So, if you begin to sense that your dog is just not acting like himself (or if he is clearly sick or hurt) then it’s important that you find what is causing his discomfort and seek proper care and treatment as soon as possible. Your first inclination may be to try to help your dog yourself before taking him to the vet. While home remedies and alternative treatments performed without the guidance of a veterinarian may sometimes work, other times they may not and your dog could actually become worse if you don’t get proper treatment for your dog fast enough. So if your dog doesn’t seem to be getting better within 24 hours of trying a home remedy, it’s important that you take your dog to a veterinarian or pet emergency center right away. For minor doggie ailments, it often makes sense to try a home remedy instead of rushing your dog to the vet every time. However, if at first you don’t succeed, then make sure that your dog gets the proper treatment from a veterinarian. At the very least, call your vet for advice. Your dog’s life may depend on it! Dog dry skin remedy – home remedy recommended by a vet; dog owners swear by it! How to check your dog’s vitals – how to “read” your dog’s gums, pulse & temp. Dog diarrhea treatment – best home remedies for dog diarrhea; when to see the vet. Human medications for dogs – which human meds are safe for dogs & which aren’t. 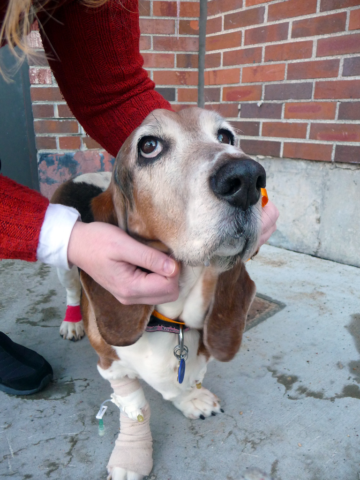 Dog surgery recovery tips – step-by-step instructions to help your dog after surgery. Dog eCollar alternatives – to prevent your dog from licking wounds; alternative to the traditional eCollar. As your dog’s primary health care provider, it makes sense to simplify the process of visiting the vet whenever possible. How to get help with vet bills – when you can’t afford to pay, there is help! Pros & cons of annual dog vet visits – are they really necessary or not? Find a mobile vet who makes house calls – for dog grooming, dog vaccinations & dog health problems. After-hours pet emergency vet services – how to find a veterinarian when most vet offices are closed. Taking samples to the vet – see why you should always take pee, poop, vomit, and other samples to the vet. While we don’t like to think about worst-case scenarios when it comes to our pets, following are things that could actually happen if you don’t take adequate steps ahead of time to protect your dog. These helpful tips could save your dog’s life! Unfortunately, accidents happen. It’s a fact of life. Our eyes cannot be glued to our dogs 24/7. But we can do everything in our power to make their world safer. Fortunately, we can all learn some valuable lessons from others whose dogs have survived terrible accidents and near tragedies. Yes, dogs fall out of car windows – even when they’re rolled up! Dog proof trash cans – how to keep your dog out of the garbage; tips for dealing with dog trash can invaders. Lifesaving dog emergency tips – how to do dog CPR, and include your dog in your family’s disaster plan. Dog hot car laws – what you need to know, plus how to report it. Dangerous dog collars – see how everyday dog collars can be dangerous for your dog. Dog ate chicken bones? – it happens far more frequently than you might think; here’s what to do! Dog Safety: What If Your Dog Runs Away? Over time, your dog becomes accustomed to feeling safe within the confines of your home, his crate, your backyard, and a variety of other boundaries within his environment. However, if your dog gets spooked, gets loose, or runs away — he will immediately become a stranger in a strange land. Here are some things that you can do now so you’ll be prepared if your dog ever becomes separated from you. Dog emergency checklist – do these things now in case your dog ever gets separated from you! Dog microchip facts – all the reasons you should get your dog microchipped. 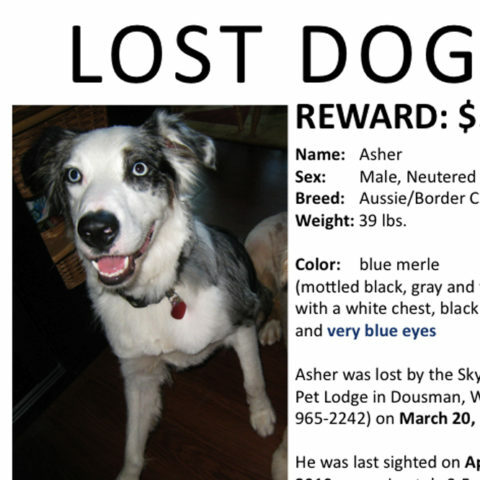 How to find a lost dog – what to do if your dog disappears unexpectedly; steps to follow. Found a stray dog? – what you should do when you find a lost dog; steps to follow. Invisible fence facts – thinking of installing an invisible fence? check out these pros and cons first. Prevent your dog from running away – by teaching him how to ‘be caught’. More pet safety tips, predicaments & warnings!